The debate on the use of drones in the Afghanistan – Pakistan borderlands has been hijacked, by its defenders just like by those who condemn the drone war. Statistics, legal arguments and some dramatic personal accounts can all be used to argue for or against. I would even argue that simply having these debates (e.g. are drones taking out the bad guys or rather more civilians?) can be dangerous. Assume we could actually prove that every person killed by a drone strike was a person with a direct affilitation to the Taliban – is this where the debate would end and drones would start to shower unquestioned? Or assume we would actually have surveys with a significant n that show that all people living in the area support drone strikes. This by no means should lead to the assumption that drone strikes are actually a good thing (you can do the reasoning in the other direction as well)! This pickering over numbers and significance fails completely to describe what significance the drone war actually has for the population in the targeted areas, and for the West’s perception of the targeted Other – they are largely used to keep people who are far away from the Predator’s impact busy. People like me. I am just acting in perfect bhutto/zardari-like fashion – have a say in it all while keeping my assets save here in Switzerland. I am neither an expert on drones, nor on the FATA, nor on bilateral politics in conflict. I care little for singular individual victim’s stories that are thrown at me in my twitter feed to make me choose sides. I trust them just as little as some Obama speech on how ‘for the most part’ there were no civilian casualties. These arguments are not brought on to solve the problem, but solely to propagate one’s own stubborn conviction on the issue. I am not going to argue for or against the use of some weaponry here, but just want to pull together some aspects of the drone debate that get scant attention. All I can contribute, is the fact that we (our NGO) work in KP in the medical field, and I will highlight some interesting publications in German. We run a hospital just outside FATA, and children not growing because of malnourishment, people dying because a lack of clean water and the ignorance from the government’s as well as many people’s side is a far greater threat to the people than hovering drones – it’s deadly to civilians, and it is long term. Unfortunately it is not heavily discussed however and very little is done against it, although it would perhaps be a lot easier to solve. On the other hand, people who live in areas that are not subject to the drone war, feel its impact directly. The security situation does not only imply that foreigners need to restrict their movement, it increases food prices and stops doctors from visiting the area. Furthermore, there are some recent German papers – on law (Journal of International Law of Peace and Armed Conflict – Themenheft „Nicht-bemannte Waffensysteme und Humanitäres Völkerrecht“, 2/2011) but more importantely on the concept of ‘ungoverned space’ (Conrad Schetter in Geographica Helvetica Heft 65/3) that I will look at. Two worthwhile reads on the recent history of drones and our perception of them are by John Sifton in the Nation (specifically on drones) and Daniel Trombly (specifically on the perception). Another article by David Bell in TNR also goes along the legal arguments I will get back to when looking at the discussion from the humanitarian law perspective. All of these look at the drone as a weapon. I want to look at it as a scientific tool. When I went to one of our University’s libraries to pick up a journal for this post series, students at our Informatics Department were just testing their own drone – some years back we probably would have just called it a remote controlled helicopter. It has become a fancy topic in different fields, and I assume it will also at some point gain importance in our Environmental Engineering and Sciences field. The fact, that this technology is being fostered by its use in a war, is a phenomenon that reminds one of one of the most important surveillance techniques in Environmental Sciences today – the Radar. It was invented well before the first World War, but only further developed when its use became apparent for Aircraft detection most prominently by the Germans, who set up huge Radar stations around Berlin and later in many different places. 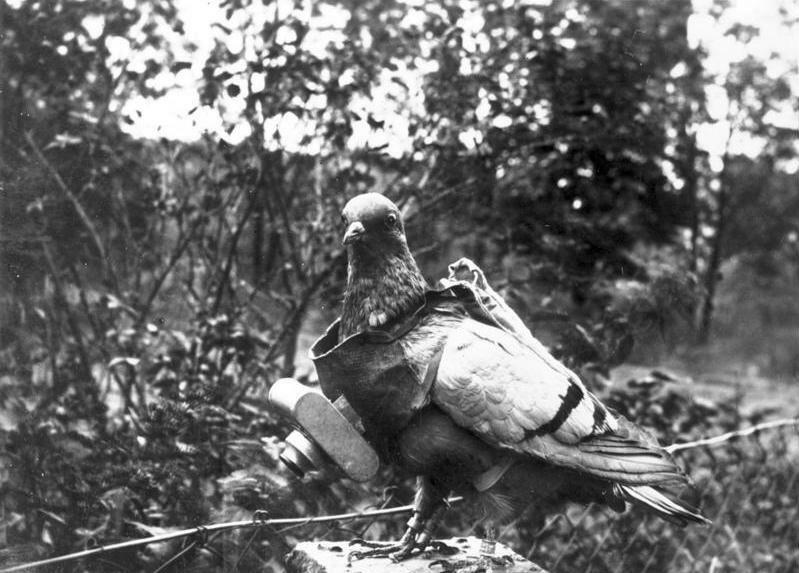 The first drones, just for surveillance purposes were hence the so called Homing Pigeons – the beginning of today’s scientific remote sensing. The FATA, considered ‘lawless’ and without any chance to hold anyone accountable (or if they try, one can easily make sure they stay mute) is an ideal area to test and develop a tool that may come in handy for all kinds of purposes in future. What is very different for the drones compared to the time when the Radar was tested, is that the Radar would actually rather make sure the civilian population was safe from air strikes, while many indications point to the fact, that the drones are actually tested on civilian population. Simply discussing the legality of drone strikes, I find problematic – for the earlier mentioned arguments. Even if all legal reasoning would point to the fact, that drone strikes are in all international legal frameworks to be considered acceptable, this does not prove at all, that it is actually a good idea to carry them out. Neverthless, there are some points that are worthwhile considering. There is of course debate in the English (US) speaking/writing world on the legal aspects of the drone war. What is interesting about the publication by the ICRC however, including mainly German authors, is the impartiality of all the contributions – because it is the Red Cross but also because I find US writers often find it very hard to detach themselves from axiomatic presumptions of ‘national security’, that Afghans and Pakistanis all act with anti-US sentiments and the like – a handicap the authors in this journal do not grapple with (that issue a difficult topic in itself, Tony Judt struggles with that in his dialogue with Timothy Snyder in the ‘Age of Responsibility’ Chapter of ‘Thinking the Twentieth Century’ – unfortunately the European Intellectuals are keeping themselves largely out of the debates circling around the war in Afghanistan and Pakistan, it’s not just that them publishing in another language than English keeps them unnoticed). The three significant contributions are by Wolfgang Richter (a former colonel in the German army, now working at the SWP), Felix Boor (Uni Bochum, he is interviewed in the Austrian newspaper DerStandard on the issue) and Christian Schaller (SWP). They argue, that whether drones are used in the war in the frontier areas is not so much the issue – they acknowledge that drones may be more effective than fighter planes would, and that the action of the international forces in the FATA can be considered legal since they act on the invitation of the Pakistani government (they acknowledge that this is unclear, but I agree that it can be considered most likely the case). But they emphasize that this observation leaves the question unresolved, whether the armed conflict there itself is legitimate the way it is lead, and that by justifying from different standpoints – self defence and an international conflict with terrorists – the Obama administration is confusing ius in bello and ius ad bellum and hence contradicting itself (Schaller). Richter observes, that ‘Under certain circumstances, putative tactical advantages (that is, the effectiveness of the drones) may have negative consequences on the strategic aim of the operations.’ Richter also looks at the problem of identifying justifiable targets: ‘The appearance of armed civilians, does not imply them being part of an islamistic terror organization or the Taliban; and not all armed groups comply with the humanitarian-legal requirements to be considered elligible targets for continuous attacks. Armed civilians, who only take part in armed encounters sporadically and without a coherent organisation, are not considered protected like civilians, during the active encounter; they may be attacked during the encounter and during the retreat. Apart from that, they need to be recognized as civilians however, and are granted their respective rights.’ Boor states, that the belligerent nexus needs to be readily given when taking out anyone with a drone, otherwise he needs to be considered a civilian. The debate on the space itself where this war actually happens, and how we percieve it, is often only marginal. There are few who dedicate their work to – I have reviewed one example earlier. Conrad Schetter had a great article out on the terminology of this perception – ‘Ungoverned Territories – a conceptual innovation of the War on Terror‘ in the Geographica Helvetica journal (it has just become available online here). He specifically looks at the invention of this terminology in the RAND report and the paper by Lamb (2008) which shaped the narrative in the following years. I translate some of his observations here to illustrate what his arguments are. He sees the term ‘ungoverned territories‘ as a ‘deliberate effort of a conceptual innovation‘ to delinate space around a very unclear concept – similarly to vague ‘axis of evil’ of Bush and the ‘defence of our freedom on the Hindukush’ by Struck. The aim is to create political and analytical tools for situations, which could not be solved with the to date available vocabulary. The effectiveness of such conceptual innovations depends on how it institutionalizes itself in the public and scientific debate and whether it becomes a framework to legitimize political actions. He wants to focus on two contexts: (Space)-rhetoric in the area of security policies and how specifically through blurring and over-simplifications demands for safety are created and how these are then used as a legitimization for political and military actions. He bases his observations on the two documents mentioned, on Zellin’s article ‘Tribalism and the future of conflict’, on Rice’s introduction of the notion that spaces in Pakistan are ‘ungoverned’ in 2007/2008 (for example in this NPR interview) and Obama’s mentioning of the area as ‘vast, rugged and mostly ungoverned’ in 2009. Manan Ahmed in his ‘Where the Wild Frontiers are’ dedicates a whole chapter to this issue, with Clinton and Kerry as examples. Phenomena like warlordism, patronage and corruption tend to surface most prominently, where the state is actually present. Here an institutional bricolage happens, since formal and informal rules overlap. The term ‘ungoverned’ suggests furthermore, that alone the state owns political legitimacy, and that non-state actors and institutions are essentially illegitimate. Thus, in both reports, terrorists are mentioned in line with insurgencies, criminal networks and warlords. This view overlooks, that criminal networks are often closely interwoven with the state apparatus or that state actors may be closely involved in terroristic activities. Since the term was coined based on initiatives of the US Army one has to ask, how a solution for this problem was envisioned based on what means were available. He adds that the term ‘ungoverned territories’ suggests, that the space where the state has no power can be demarcated with a clear line and completely overlooks the possibility of tranition zones/hybrid spaces and the possibility that there may be spaces that were never part of the state and where no territorial thinking as inherent to the US army may exist. The approach of ‘ungoverned territories’ negates, that people move in space, have networks that transcend this space and its borders, yes even make political decisions outside of spatial constraints. Transnational movements and processes of globalization are completely left out in the RAND report. It is astonishing, that the RAND and the UGA studies, specifically identify border areas where extensive smuggling and migration takes place as ‘ungoverned territories’. […] Following this reasoning, the border regions of the US and the EU should be regarded as ‘ungoverned territories’ par excellance. He notes how the RAND report only identifies ‘ungoverned territories’ in the West in ‘ Muslim ghettos in some European cities’, while other publications conflictingly identify it as ‘rugged and remote areas’ and ‘densely populated cities’. The concept provides no contribution to a reflective debate on the connections between territorial figuration, statehood, governance and terrorism. On top of that, the ideological use of the term is […] highly questionable. The discussion on statistics of drone efficiency, the drone war’s legality and who are civilians/terrorists and who are not, are highly futile until we have not developed an understanding of the space this debate is happening in.